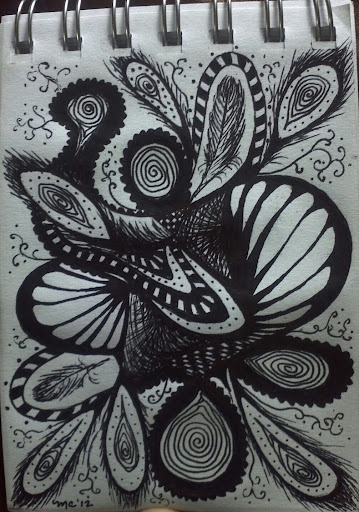 My dear friend introduced me to a new, free-spirited art/meditation form called Zentangle, and it is changing my creative force! For the first time in many years I find a drive and a passion for the act of creation. These pieces are different than anything I have ever done, and they have the spark and life of the kind of art I seek to collect. The images form like a destined accident as the pen just follows the patterns....they take on a life of their own whether I start with an idea or not. The first images were created in a tiny 3 1/2 x 5 inch Sketchbook with gel pens. As my love and obsession with this has grown, more professional materials have been accrued. I hope you enjoy looking at these as much as I enjoyed making them! If you see one that you would like to have a print of, contact me and we will make it happen.